I've been working, occasionally and haphazardly, on the digital restoration of my collection of family photographs. We've got some interesting family history on my mother's side - her maternal grandparents were missionaries in what was once the Belgian Congo during the late 1920s until the 1960s. It's always troubled me, the way ancestors' actions can trouble you in the present. From a postcolonial and modern standpoint a lot of what they attempted to achieve and believed about Africa (in general and the Congo in particular) and its people was horrendously mistaken, offensive, and heavily paternalistic (we've got letters, newspaper clippings, recordings, and even an unfinished biography that testify to that fact). Nevertheless, the photographs they took while in Africa are historically compelling and many of them are really beautiful in my opinion. I'll probably be posting them sporadically. "The animal with the horns is a horse antelope. The one with the hat on is Henry." Laura (Neel) Wheeler, date unknown - I kept the fingerprint visible on this one, I think it adds to it. 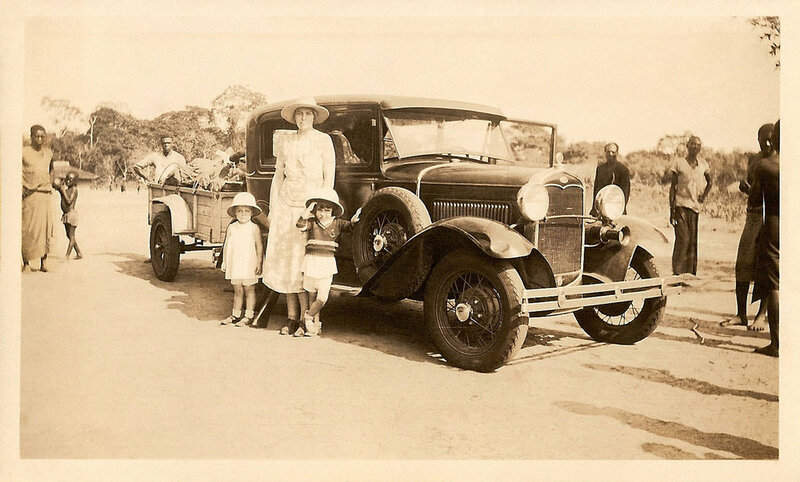 "At Victoria Falls, December 1937"
"The reception party at Emungu. Note little drummer boy - "Yanyi" Sunshine. Man with big hat to your left is the preacher in charge. H.T.W."